KALININGRAD (Sputnik) — The new Admiral Grigorovich-class (Project 11356Р/М) Admiral Makarov frigate has been commissioned with the Russian Navy, a representative of the ship's manufacturer, the Kaliningrad-based Yantar Shipyard, said Monday. "The transfer act for the Admiral Makarov frigate was signed at Yantar on December 25 … Thus, it was confirmed that the third ship of Project 11356 was transferred to the customer," Sergey Mikhailov told reporters. Trials of Russia's first Admiral Grigorovich-class frigate were successfully completed in the Barents Sea Two years ago. The frigates, displacing 3,850 tons, are designed for anti-ship and anti-submarine warfare as well as for air defense missions. It can operate both independently or as part of convoys and naval task forces. 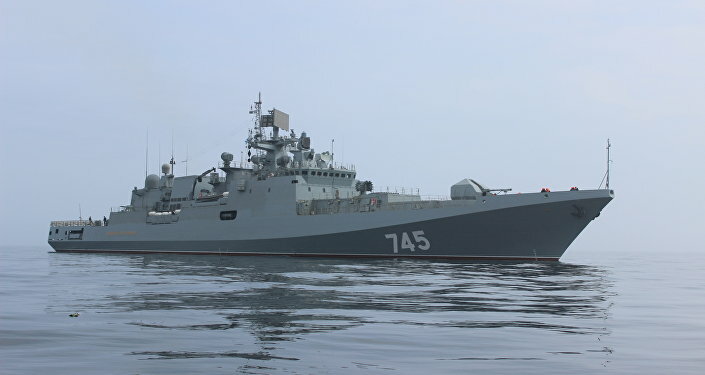 Earlier, Russian Black Sea Fleet said that during the first frigate's gun firing drills the crew had managed to work out an algorithm for conducting single-ship combat against the 'enemy' surface ships.